This Philadelphia Eagles flag temporarily flew outside of the Betsy Ross House in Old City Philadelphia, Monday, Jan 29, 2018. 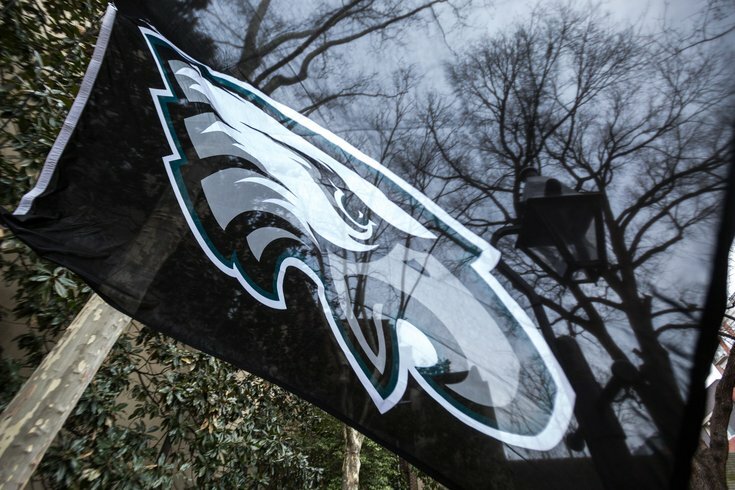 Upon rescinding the Philadelphia Eagles invitation to visit President Donald Trump at the White House, the president's press office promised a different celebration would go on in its place Tuesday for those who had traveled to Washington, D.C. Instead of the honoring the Super Bowl champions, fans were invited to the White House to "be a part of a different type of ceremony – one that will honor our great country, pay tribute to the heroes who fight to protect it, and loudly and proudly play the National Anthem." Trump did attend this event, featuring the United State Marine Band and the United States Army Chorus. After the anthem was played, the president spoke, but he never mentioned Philadelphia Eagles directly. He did reference the size of the crowd gathered for the national anthem event. "This is a beautiful big celebration," Trump said. "Actually, to be honest, it is even bigger than we had anticipated." The president also commented about "why young Americans stand for our national anthem." "Maybe it's about time that we understood," Trump said. "We stand to honor our military and honor our country and to remember the fallen heroes who never made it back home. We stand to show our love for our fellow citizens and our magnificent Constitution. We stand to pay tribute to the incredible Americans who came before us and the heroic sacrifices they made." Watch video of the event from the White House's Facebook page below. It begins with the president's remark's just after the national anthem is played and ends as Trump leaves the podium and begins to shake hands with some in the audience. The camera never shows a crowd shot to get a sense of the size of the audience. This video from CNN continues to play as Trump briefly mingled with some in the crowd and then returns to the White House – skip to 1:56 mark to see when Trump begins interacting with the spectators. The CNN then pans out and shows a wider shot of some of the audience that had gathered to watch the ceremony. There was definitely a sizable crowd gathered, but it's hard to estimate exactly how large from the video footage, although some media reports from the White House's South Lawn raised questions about how many actually were Eagles fans. And there was one person who kneeled during the playing of the national anthem.